David Priest is an equine veterinarian and owner of a small practice that specializes in treating race horses. He spends his summers in Kentucky and when the weather begins to get colder, he follows the horses to southern Florida where they train in the winter. He conducts scans using his own modalities as well as receives studies for teleradiology reads from individual horse owners and other practices. His modalities send studies via autorouting to Horos where he views and analyzes the images. For external reads, he typically receives an email from a veterinarian with a link for him to either download the study or view it on the web. He opts to download the DICOM studies and view them using Horos as he’s found that the webviewers included commonly lack the same functionality. “There’s nothing like Horos on the market today,” he noted. David does between 60-100 studies per month and generates a physical report on at least half of these. The other studies he typically talks through either on the phone or in person with his clients as part of a consultation. Reports are a practice driver for David as they carry a lot of weight in marketing to referring veterinarians. They drive his business not just for future reports, but for surgeries and other higher revenue services he offers as well. His reputation as a surgeon then further drives demand and business to his practice. So with this always in mind, it is of the utmost importance for his reports to come off as professional and be appropriately branded. That said, as a small practice, it’s never been economical to buy an enterprise PACS system with integrated reporting software. As a result, David has had to rely on using either Pages or Word as his solution to create reports. Since he frequently reports on many of the same type cases, he has created templates for each on his computer that he keeps saved in a folder on his desktop. While viewing a study in Horos, David has to search his desktop folder for the correct template, then jump back and forth between Horos and Word or Pages to create the report. He then spends time formatting the report to ensure it looks professional and then saves it as a PDF. Next he launches his email, finds the report, and attaches it before finally sending it off to its intended recipient. David described the process as a “cumbersome workflow that wastes time.” He added that coordinating the studies with his reports is also problematic as his studies live as DICOM files in Horos while his PDF reports live in a desktop folder. While he loves the Horos viewer, the workflow challenges surrounding reporting had begun to pile up. This is why when David heard that Horos Project developers had been working on a solution to help optimize this workflow, he jumped at the opportunity to be one of the first to try the new software. “I’ve found no replacement for Horos, so anything that streamlines using it I’m interested in,” David expressed. So David joined a group of 50 Horos community members who were given beta access to Horos Cloud Reporting, an integrated software plugin that enables reports and templates to be created within Horos then saved and shared securely through the cloud. The beta program lasted several weeks and during this time, David completed nearly 20 reports leveraging the platform. He commented how cloud reporting in Horos improved his workflow by obviating the need to launch a separate text editor like Pages or Word to create a report. He also noted it saves him time otherwise wasted searching his computer for templates as they can now be stored right within the platform. “Saving templates in Horos Cloud Reporting is awesome. I’ve created many for common uses,” he added. 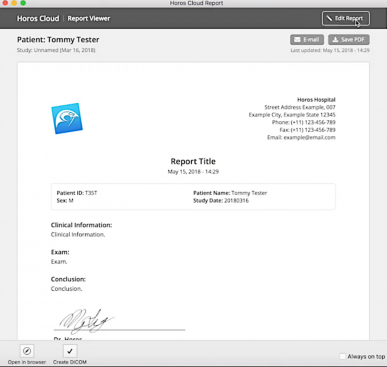 He also stated that perhaps the best feature of Horos Cloud Reporting is the ability to save a report not only as a PDF but also as a DICOM file alongside its associated study directly in Horos rather than in a folder somewhere else on his computer. This coordination saves time when trying to find reports on historical studies and creates a more cohesive, usable archive. The other big value he noted was from a marketing perspective. Out of the gate, reports look professional without having to waste time with formatting. He said the ability to easily add his logo and customize reports “makes them look good” and helps in his marketing to referring physicians. This, he stated, adds a “fair bit of value” over his previous solution and “not just from an in the background legal document kind of way” but by creating reports that actually serve as marketing tools. So it’s no surprise that as the beta ended, David opted to continue using Horos Cloud Reporting under its monthly subscription model. He said that ultimately the value comes from being able to get rid of other services to help him streamline his Horos workflow. Whether he’s in his office or leveraging a mobile DX at the horse’s side, he’s now able to send studies to Horos, then diagnose and report all from the same place. If you’re interested in creating professional looking reports with key images that you can easily share with patients or referring physicians, we have a solution for you! The Horos Project is licensed under the GNU Lesser General Public License, Version 3.0 (LGPL 3.0). OsiriXTM is a trademark of Pixmeo SARL. HorosTM is a trademark of The Horos Project. Horos CloudTM is a trademark of Purview.